1. What’s new for 2015? It’s a clean-sheet redesign for the vehicle that’s bling incarnate. 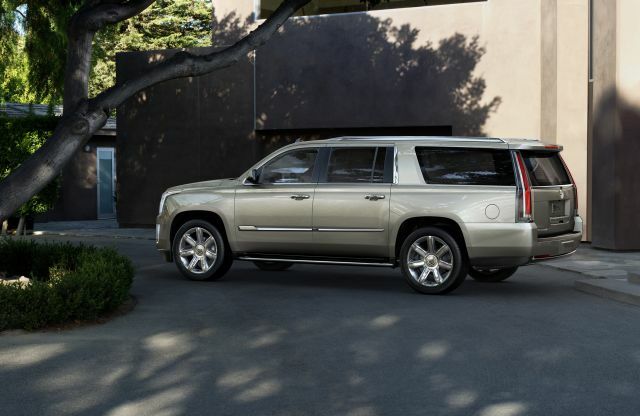 Compared to the outgoing 2007-2014 Escalade, the ‘15 is brasher on the outside, more opulent inside, and more powerful under the hood. This full-size luxury SUV borrows the basics of its engineering from the similarly redesigned 2015 Chevrolet Tahoe and Suburban and GMC Yukon. It comes in two lengths, standard and as the ESV, which is 14-inches longer in wheelbase and 20.4-inches longer overall. Both can seat seven or eight passengers. All models have a V-8 and the choice of rear- or all-wheel drive (AWD). 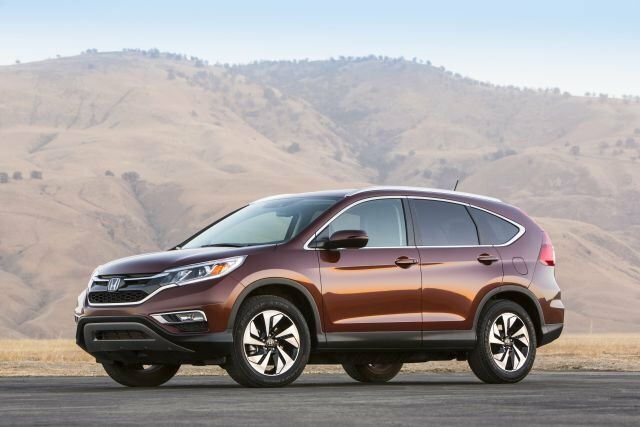 Trim levels start at Standard and ascend through Luxury, Premium, and Platinum. Between standard and optional equipment, Escalade is available with pretty much every imaginable comfort, convenience, and safety feature. It’s expensive – you can spend six figures on this super-Suburban – but there is a little room for negotiation. 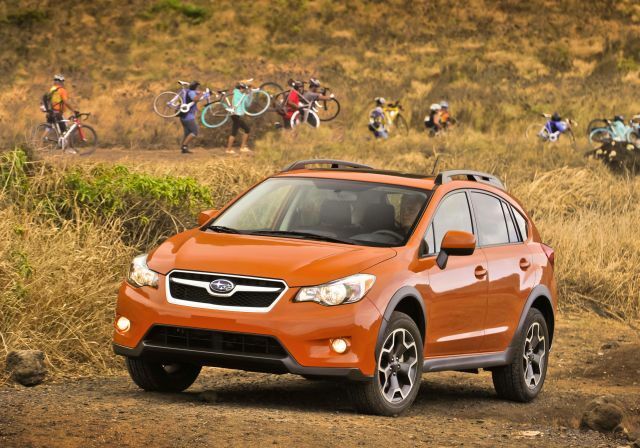 With rear-wheel drive, base-price range is $73,965-$90,270 for standard-length models and $76,965-$93,270 for ESVs. (Base prices include Caddy’s $995 destination charge.) AWD adds a stiff $2,600 to each trim level. 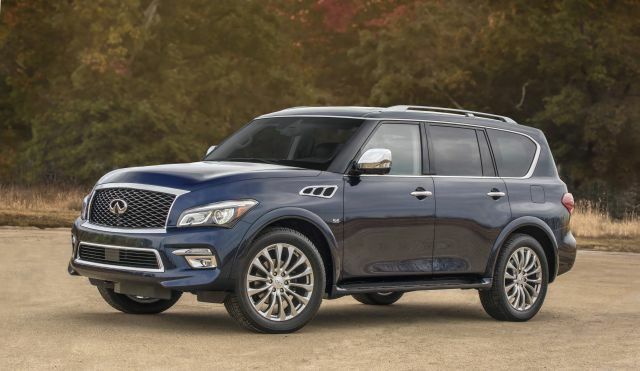 This make it more costly overall than its closest rival, the Lincoln Navigator, but more in line with such premium imports as the Infiniti QX80, Land Rover Range Rover, Lexus LX 570, and Mercedes-Benz GL-Class. Average transaction prices for the ‘15 ‘Slade have been highly variable over the last several months, but pricing service TrueCar.com reports most buyers paying about $1,863 less than manufacturer’s suggested retail price. 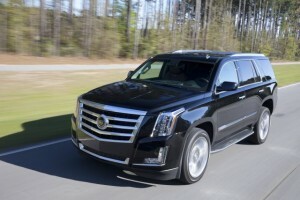 Cadillac-parent General Motors will occasionally offer cut-rate lease and financing offers on the Escalade, but fairly strong demand continues to keep a lid on such incentives. Not for quite a while, but probably sooner than they came for the outgoing version. That vehicle’s design dated back nearly a decade and didn’t change a whole lot. 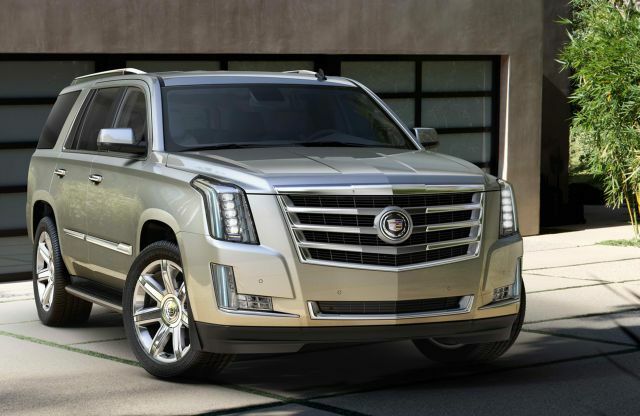 Vehicle lifecycles are no longer that lengthy, so a brand-new or significantly updated Escalade probably will show up before 2022. Expect some notable updates for model-year 2018, with likely trim and equipment tweaks between now and then. The best choices are at the top and near the bottom of the model range. Ultra-high-rollers will relish the Platinum’s unique styling touches and country-club interior. For everyone else, the Luxury model has pretty much everything a high-end SUV buyer could want. All trims come pretty well loaded out of the gate. Among standard features are leather upholstery, 12-way power adjustable heated/cooled front seats, heated second-row seats, power-folding third-row seat, heated power tilt/telescopic steering column, power-adjustable pedals, tri-zone automatic climate control, adaptive remote engine start, navigation system, Cadillac’s CUE (Cadillac User Experience) infotainment system, and LED headlights and taillights. 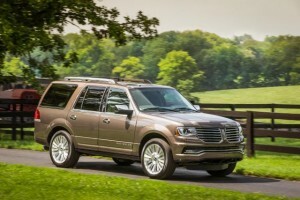 Luxury models add 22-inch wheels (the Standard model has 20s), a power sunroof, and a high-end Bose-brand audio system. The Premium has a standard rear DVD entertainment system. Platinum editions have unique wheels and exterior trim, Nappa-brand leather upholstery, leather-wrapped dashboard and door panels, a dual-screen rear DVD system, and center console cooler box. A big vehicle needs a big engine and with Escalade you get only one choice. Luckily, it’s a 6.2-liter V-8 with 420 horsepower and 460 pound-feet of torque. Power builds smoothly and steadily. Cadillac claims 0-60 mph in about 6.0 seconds; this body-on-frame SUV doesn’t feel quite that fast, but you’re never wanting for power. The first few batches of ‘15s came with a six-speed automatic transmission. Early in calendar 2015, GM replaced it with an eight-speed automatic as standard. The new eight-speed is a better match for the engine, providing surprisingly quick response to throttle inputs. Curb weights range from 5,600 to more than 6,000 pounds – that’s 1,500 pounds more than Caddy’s SRX compact crossover – so Escalade’s not going to be very frugal. At least fuel economy is competitive with other V-8 luxury SUVs. The EPA rates it 17 mpg city/highway combined with both rear- and all-wheel drive, and 16 mpg combined for the AWD ESV. That’s on par with the Lincoln Navigator, which has two fewer cylinders. 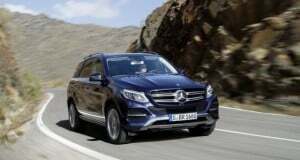 As a side note, the premium SUV does not require premium-octane gasoline; regular can be used with a slight reduction in horsepower. And interestingly, combined ratings with the eight-speed automatic are unchanged from those with the six-speed. 7. How does the it handle? About as well as can be expected for a high-riding wagon that tips the scale at up to three tons. 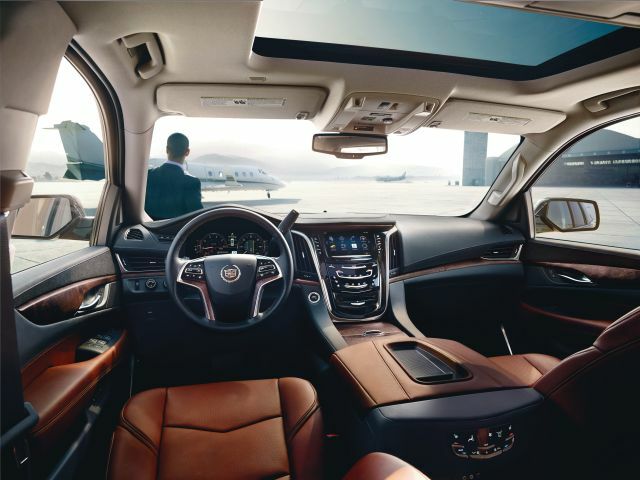 You won’t be carving corners in the mountains, but Escalade competently copes with the daily grind. Close-quarters maneuverability isn’t great, particularly in the larger ESV, but again, that’s something you have to expect. Since 2wd versions are rear-wheel drive, with relatively little traction-enhancing weight over the back tires, AWD is a necessity in areas where it snows. This is a bit of a mixed bag. Some of us find the CUE infotainment system’s tablet-style interface easy to negotiate. Others complain the touchscreen responds to inputs sluggishly. Cadillac offers a CUE “helper” app with interactive and video tutorials to show how everything operates. It’s helpful, but only available on the Apple iPad. The climate controls are an odd amalgam of virtual and physical buttons, but the layout is logical. Escalade’s instrumentation is bright and crisp. The configurable screen between the main gauges can show phone, audio, and navigation information in addition to the usual trip computer data. A full-color head-up display is standard on the Luxury, Premium, and Platinum. Despite its rugged body-on-frame, truck-type chassis, Escalade delivers a surprisingly smooth ride thanks to its standard Magnetic Ride Control suspension. Those standard 12-way power front seats, power tilt/telescopic steering column, and power-adjustable pedals, allow folks of virtually any stature to find a suitable driving position. The standard leather upholstery is plush while the Nappa hides on the Platinum model dial up the luxury even further. There’s stretch-out space in the first two seating rows. However, third-row access, room, and comfort were arguably the previous-generation’s weakest points and, unfortunately, that’s true of the redesigned model. Accessing that rearmost row is awkward, and once you’re situated, there’s less headroom and – especially in the standard-length model – far less legroom than there should be. Blame the bulky floor shape needed to clear the solid rear axle used on these big GM SUVs. Every rival has a less intrusive independent rear suspension design. If you plan to haul more than five passengers on a regular basis, the rival Lincoln Navigator has the most accommodating third row. Limited crash-test data is available for the ‘15. Both the standard wheelbase and ESV versions did earn the maximum five stars for side-impact protection under the federal government’s 5-Star rating system. Front-crash and overall occupant-protection scores were not available in time for this review. And the industry-funded Insurance Institute for Highway Safety Highway Safety had not yet tested the newest version of the big GM SUVs. All Escalade models include a standard complement of airbags and GM’s unique “front center airbag,” which fits between the front seats and is designed to deploy in the event of a side-impact crash. A surround-view-camera system is also standard across the board. GM’s OnStar telematics with emergency services, crash notification, roadside assistance, hands-free calling, and 4G LTE Wi-Fi hotspot capability is standard. Blind-spot alert, lane-departure warning, rear cross-traffic alert, lane-change alert, and forward-collision alert are standard on Luxury and above. Adaptive cruise control and pre-collision braking are included on the Premium and Platinum. While it hasn’t been on sale long enough to accrue quality and reliability data, it appears the new Escalade should hold its value relatively well. 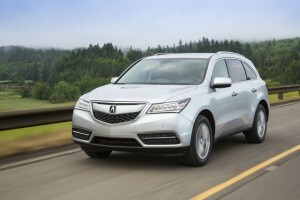 Owners of the previous-generation model frequently ranked it at the top of the class for dependability, according to surveys by leading automotive research firm J.D. Power. Sales and service satisfaction also rate slightly above average among luxury nameplates, according to J.D. Power surveys. Research company Intellichoice named the 2015 Escalade a “Best Overall Value of the Year” in its Luxury Utility category based on a five-year total cost of ownership projected to be well below the class average. Residual-value-tracking firm ALG expects the ‘15 to retain 37-40 percent of its value after five years (depending on trim level and body style). 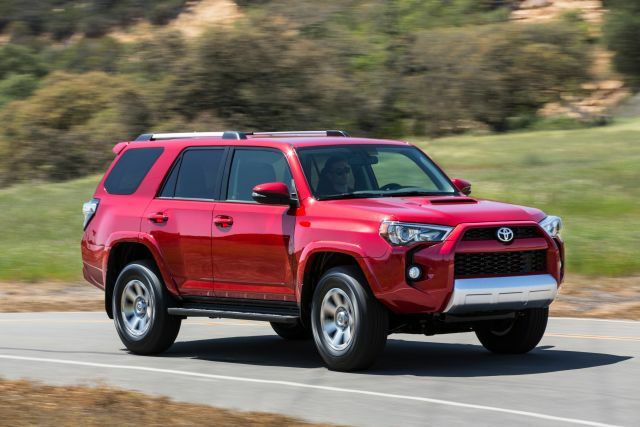 That’s an improvement of 7-8 percentage points over the outgoing model and just shy of the 41 percent five-year residual posted by the category leader, the Toyota Land Cruiser. 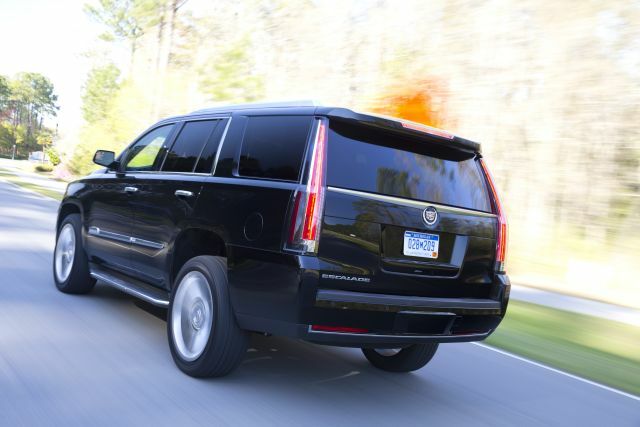 Since the nameplate’s launch more than 15 years ago the Escalade has never failed to stir emotion. Depending on your perspective, it’s the embodiment of the American dream or an overwrought symbol of conspicuous consumption. Let’s put all that aside and look at this vehicle on its merits. This redesigned model improves upon its predecessor in every way. It’s more powerful, smoother, quieter, and more opulently appointed. The promise of solid reliability and improved resale value makes it attractive as well. It lacks the off-road prowess of a Range Rover or Lexus LX 570 (not that such a thing matters much to most buyers), and its third-row seat is an embarrassment in something this large. It is a fine choice among large luxury SUVs but perhaps best appreciated by extroverted high rollers who thumb their noses at the politically correct crowd. Big, brave and body-on-frame, these are the ultimate incarnations of the original sport-utility vehicle. No car-based crossovers here, these luxury SUVs have truck-chassis toughness overlaid with opulence, power and prestige. 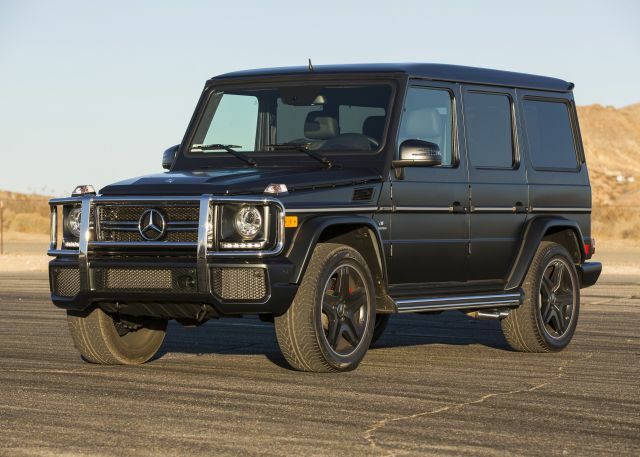 Names like Escalade, G-Class, and Land Cruiser signal entry to this rarified realm, where just one model starts under $60,000 and the most expensive begins at $138,075. Arranged alphabetically, this buying guide describes them all.